Spinach often called the “Life Protective Food” is a must ingredient in the diet chart of every individual. This green and leafy vegetable can be used as a food, because it has a number of therapeutic actions on each and every system of the human body. There are innumerable health benefits of Spinach or Palak as we call it in Hindi. From protecting heart to improving eyesight, preventing type II diabetes to improving digestion, spinach is a must have green leafy vegetable. Man is said to be a frugivorous human and a frugivorous human is usually defined as one that lives on fruits and vegetables. 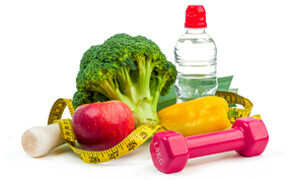 The human body is always in dire need of fresh green leafy vegetables. Although it is difficult to count all the benefits of spinach on fingertips, today in this post, let’s find out the top 23 unforgettable health benefits of Spinach on human lives. Spinach (Spinacia oleracea) is an edible flowering plant in the family Amaranthaceae native to central and western Asia. Common spinach was long considered to be in the family Chenopodiaceae, but in 2003, that family was merged into the family Amaranthaceae in the order Caryophyllales. Within the family Amaranthaceae sensu lato, Spinach belongs to subfamily Chenopodioideae. It is an annual plant (rarely biennial) growing as tall as 30 cm. There are three types of spinach. One is known as ‘Savoy’, which has dark green, crinkly and curly, leaves. The second one is flat- or smooth-leaf spinach having broad, smooth leaves that are easier to clean than ‘Savoy’. Lastly, semi-savoy is a hybrid variety with slightly crinkled leaves. It has the same texture as ‘Savoy’, but it is not as difficult to clean. Spinach is believed to be of Persian origin. By the 12th century, it spread across Europe and became a desirable leafy green known for good health; a reputation that stands firm to this day. The dishes containing spinach (and a creamy sauce) are often described by the name of “Florentine”. But do you know there is a history behind it? It is thought that this name has a connection with the Italian wife of France’s Henry II; Catherine de Medici and dates back to the 16th century. The unverified tale states that Catherine introduced spinach to the Court of France and to honor her Italian heritage, she then decided to call any dish containing spinach Florentine. The nutritional benefits of spinach made it one of the most vaunted of vegetables so much, so that it did not escape the notice of the studio and the creators of the famous fictional cartoon series “Popeye-the sailor Man”. As all Popeye fans know, whenever the sailor feels in need of some extra strength, he simply downs a tin of spinach, and instantly sprouts bulging biceps. During the Great Depression, a 33% increase in spinach consumption was widely attributed to the character’s popularity and his famous fondness for the green stuff. Rather endearingly, spinach was also listed as the third favourite food of American children at the time. However, before knowing the health benefits of spinach let me brief you about the constituents of spinach that makes it so nutritious and beneficial for humans. What are the constituents in Spinach? Spinach is an excellent source of vitamin K, vitamin A (in the form of carotenoids), manganese, folate, magnesium, iron, copper, vitamin B2, vitamin B6, vitamin K, vitamin E, calcium, potassium and vitamin C. It is a very good source of dietary fiber, phosphorus, vitamin B1, zinc, protein, thiamine and choline. Most of the calories in spinach come from protein and carbohydrates. Additionally, spinach is a good source of omega-3 fatty acids, niacin, pantothenic acid and selenium. In addition to the nutrient richness of spinach in terms of these conventional nutrients, spinach also provides the carotenoids lutein, neoxanthin, and violaxanthin; the flavonoids spinacetin, patuletin, and jaceidin; and naturally occurring nitrates. The rich content of chlorophyll in spinach also helps combat various diseases. Spinach is already widely-enjoyed as a food, and its commonplace appearance in salad bars as well as many different types of cuisine may lead us to forget just how impressive this leafy is in terms of nourishment. “International Journal Of Applied Research And Technology” considers Spinach as a natural laxative with uncountable benefits. So, here are the most common health benefits of Spinach. Cholesterol is the main culprit in the causation of heart disease. Unwanted cholesterol passes out into intestine along with the bile and should normally be thrown out along with the stools. But some of it may get dissolved in the bile acids and get into blood. Spinach contains dietary fibre that absorbs and binds the cholesterol, and prevents it from dissolving in the bile acids. The liver is thus forced to use its cholesterol to produce more bile acids. Besides fibres, proteins found in spinach also reduce the cholesterol and other fat deposits in the blood vessels thereby reducing chances of heart attacks, and strokes. Spinach is a rich source of beta-carotene, lutein and xanthene, all of which are beneficial for eyesight. Beta-carotene is supplied to the eyes by cooked spinach. It can prevent people from suffering from vitamin A deficiency, itching eyes, eye ulcers and dry eyes. Moreover, spinach contains sufficient quantity of Vitamin A, lack of which may lead to night blindness. Thus, spinach is very effective for prevention and treatment of night blindness. The lutein and zeaxanthin present in spinach both act as strong antioxidants, preventing the eyes from the harsh effects of UV rays that can lead to cataracts. Moreover, the anti-inflammatory properties of spinach can reduce the puffiness or irritation in the eyes. One of the main causes of blindness is AMD or “Retinitis pigmentosa”. AMD is mainly a result of the degeneration of lutein and xanthene, which form a central part of the retina. Research conducted by the Oak Ridge National Laboratory, showed that by consuming spinach we can regain two vital pigments which are effective for preventing AMD. Spinach also contains a wealth of antioxidants that reduce the harmful effects of free radicals, which are known to negatively affect vision and cause age-related conditions like glaucoma and macular degeneration as well. Proper functioning of human brain forms an integral part of human well being. Components like potassium, folate, and various antioxidants, which are present in spinach, are very beneficial for your brain health. Neurologists often prescribe the intake of adequate spinach to people who are at higher risk of neural or cognitive decline. According to Neurology, folate reduces the occurrence of Alzheimer’s disease. Potassium is an integral part of brain health as well, and it has been linked to increased blood flow to the brain, and heightened cognition, concentration and neural activity. The present of antioxidants in spinach helps to combat deadly diseases like Diabetes. According to this study, high contents of magnesium can help reduce the risk of type II diabetes. Spinach is very important for our digestive system. The high content of fiber in spinach facilitates digestion. The fiber keeps the particles of food separate and prevents them from forming a mass and as result; there is a more intimate contact between food and digestive juices. Thus it stimulates peristaltic activity, quickens the pace of movement of food through the alimentary canal, facilitates digestive process, reduce the time taken for digestion, increases the bulk of the stools, and make elimination quick, easy and complete. Ok this point is interlinked with the above point. The juice of spinach is very effective in removing the accumulated waste. It nourishes the intestines and tones up their movements. It is, therefore, an excellent food remedy for constipation. Spinach rich in fiber adds bulk in stool to relieve from constipation .Thus raw spinach juice, mixed with an equal quantity of water about one pint a day, will correct the most stubborn case of constipation. High or low blood pressure problem is a very common thing in today’s life. Spinach has a very high content of potassium, which lowers blood pressure. It also contains sodium that helps in raising the blood pressure. The folate present in spinach also contributes to the reduction of hypertension and relaxes blood vessels and arteries, while maintaining proper blood flow. Thus, automatically it leads to the reduction of stress on the cardiovascular system and increase in oxygenation to the body’s organ systems for optimal functionality. This is a common problem with women mainly due to the deficiency of iron and hemoglobin content in body. Spinach vegetable is a valuable source of high-grade iron. After its absorption in the system, the formation of hemoglobin and red blood cells take place. It is thus highly beneficial building up the blood and in the prevention and treatment of anemia. Spinach juice mixed with carrot and red beet juice is excellent remedy for anemia. Spinach is given as a liver tonic in jaundice. It’s cleansing and building properties stimulate and tone the liver, gall bladder, blood and lymph circulation, and large intestine. Spinach juice has a mild laxative effect when an ounce of it is consumed along with other fresh vegetable, green or sprouts juices. A component of spinach, factor C0-Q10, which is an antioxidant, plays an important role in strengthening muscles, especially heart muscles which continuously pump blood to all parts of the body. According to the Journal of Cardiovascular Nursing, C0-Q10 can be used to prevent and treat many cardiovascular diseases like hyperlipidemia, heart failure, hypertension and coronary heart disease. We all know how much calcium is essential for strengthening our bones. Spinach contains high levels of calcium. Besides calcium, it is also rich in magnesium, zinc potassium, manganese, copper and phosphorus, which are essential bone builders. Spinach is a good source of Vitamin K, which functions in retaining calcium in the bone matrix, thereby leading to bone mineralization. This in turn can prevent an individual from developing osteoporosis of the bones. The spinach juice is effective in strengthening the gums, preventing, and curing dental cavities. Chewing raw spinach leaves cures pyorrhea. The high concentration of alkaline minerals is also responsible for strong teeth and gums. Besides the Vitamin C content in spinach, also helps prevent scurvy. Spinach contains high amount of protein that can be easily broken down by enzymes into amino acids that are essential to humans. The re-formed mammal proteins aid our muscle development, growth, and our body’s ability to heal wounds. This in turn boosts our entire metabolism, encouraging all of our organ systems to function at their optimal level. Studies prove that spinach contains thylakoid that can curb cravings and hunger, which can further help in weight loss. Studies have found that spinach has the ability to protect the mucous membrane of the stomach. This decreases the risk of the occurrence of gastric ulcers. “International Journal Of Research In Pharmacy And Chemistry” has successfully proved this fact . Furthermore, the glycocyclerolipids found in spinach can boost the strength of the digestive tract lining, thereby preventing any unwanted inflammation in that part of the body that can cause harm. Lutein, a pigment found in spinach has been proved to reduce the risk of Atherosclerosis, a disease that is caused due to the hardening of the arteries. Ok so this is something important for the expecting mothers to know. As the richest source of folic acid, spinach is a very valuable food during pregnancy and lactation. Deficiency of folic acid in pregnant females often leads to Megaloblastic anaemia. Besides, defects like cleft palate or spina bifida may also occur due its deficiency. Folic acid is very essential for the development of fetus. Spinach is a good source of nutrition for nursing or lactating mothers and improves the quality of their milk. Besides Vitamin A contained in spinach helps in the lung development of the fetus. So none you would be mothers should miss out the intake of spinach. Spinach tops the list of green leafy vegetables, which helps prevent various kinds of cancer. It is an extremely rich source of antioxidants and anticancer compounds. Different constituents in spinach like folate, tocopherol, and chlorophyllin act via different mechanisms to treat and protect patients suffering from cancer. It contains about four times more beta-carotene and three times more lutein than broccoli. Recent studies have revealed that spinach is very effective against aggressive prostate cancer, and this has been linked to epoxyxanthophylls, which are unique carotenoids, along with neoxanthin and violaxanthin, that directly reduce tumorous activity and the spread of cancer throughout the body. Spinach has anti-inflammatory properties. The presence of several anti-inflammatory compounds makes it one of the most powerful vegetables when it comes to reducing inflammation throughout the body. The compounds are classified into the category of methylenedioxyflavonol glucuronides. Besides, protecting the heart from dangerous inflammation and preventing cancer, spinach also benefits in reducing the inflammation and associated pain from conditions like arthritis and gout, which afflict millions of people around the world. Spinach contains various phytonutrients and pigments, which protect the skin from the harmful rays of the sun, including UV rays. These not only protect, but also repair the damaged genes to some extent, thereby preventing skin cancer in the long run. The leaves of spinach are an effective diuretic food. They increase the secretion and discharge of urine. Fresh spinach juice taken with tender coconut water once or twice a day acts as a very effective but safe diuretic due to the combined action of both nitrates and potassium. It can be safely given in cystitis, nephritis and scanty urination due to dehydration. Spinach is a super food comprising of vitamins B, C and E, potassium, calcium, iron, magnesium and omega-3 fatty acids all of which are required for healthy hair growth. Iron helps the red blood cells carry oxygen to hair follicles, which is essential for healthy hair growth and strong strands. The presence of the iron and folate also reduces hair loss. Thus, consuming spinach everyday leads to healthy, gorgeous hair. So now you know about the versatility of this vegetable. Spinach protects our life from cradle to grave as development of fetus in womb to degeneration in old age. It gives its love and affection at every stage of life like a mother. However, despite the good effects, if someone is taking blood-thinners such as Coumadin (warfarin) it is important that they do not suddenly begin to eat spinach as the vitamin K content in it plays a large role in blood clotting. Besides spinach also contains potassium which can be harmful for those whose kidneys are not fully functional. If a patient’s kidneys are unable to remove excess potassium from the blood, it could be fatal. This was just a word of caution from my end. Rests of you do not forget to incorporate this life saving vegetable in your diet and enjoy its nutritious benefits. So are you ready to be strong like Popeye? 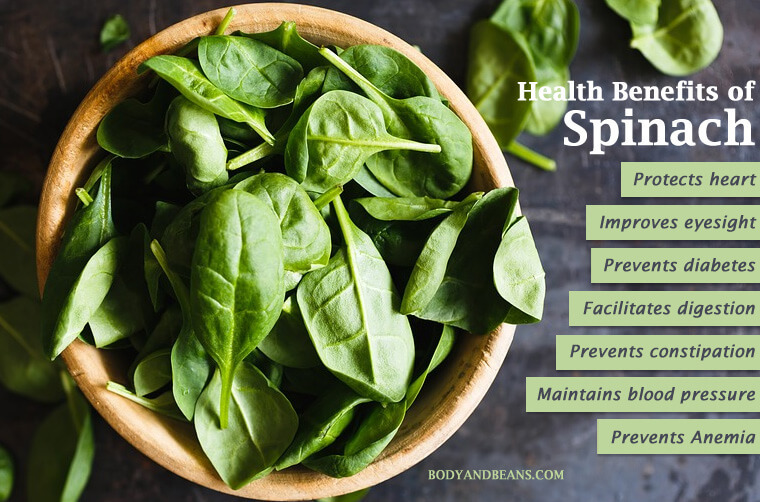 Have you benefited from spinach? Do share me the feedback in the comments below.